I am in a southwestern food kind of a mood right now, so when deciding what type of flavor to give my hummus today I went for the black beans, limes, and chili powder. I happened to have some leftover yam puree, so I decided to throw that in as well, since I love to add extra veggies to my hummus. I didn't really feel like using tahini, so I grabbed the almond butter instead...as well as the almond oil instead of regular old olive. Some cilantro and garlic joined the party in the food processor as well as some cumin...this was turning out to be anything but the usual hummus...but when it was all blended together the taste test would be the final say in whether or not this was a recipe worth sharing. I scooped up a huge dallop with a tortilla chip, and it was wonderful! It was unlike any boring black bean dip I have had...tons of flavor! This hummus would be wonderful on a southwestern wrap...and I have to warn you it is very addictive with chips! this sounds like a real winner to me~ yummy!!!! 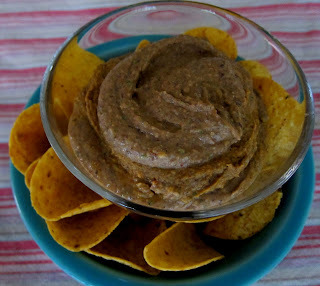 now that is one tasty looking hummus....never thought of using black beans!!! thanks so much for the inspiration! Hey Amy, this looks delicious. I'm into Southwestern food too-there's something very rich and authentic about this region's food. This is such a unique combination of ingredients! Love black beans!